"Unfathomable." That's what the head of a regional pro-fishing group is calling yesterday's vote in the U.S. House of Representatives that in part blocks spill through the Columbia Basin to help young salmon. All of Oregon's and Washington's Congressmen representing the immense watershed voted for HR 3144, which passed 225-189 and would put off a federal judge's spill order till 2022. But Liz Hamilton of the Northwest Sportfishing Industry Association in Portland says blocking spill will "accelerate salmon's demise, affecting every single species that has to travel down this industrial river." Just three weeks ago she'd heralded U.S. District Court Judge Michael Simon's ruling that because the Columbia's numerous Endangered Species Act-listed stocks "remain in a 'precarious' state," and that with decades worth of studies showing "spill volumes higher than those proposed in the 2014 BiOp will lead to higher survival rates" for young Chinook, coho, steelhead, this year's program would go ahead starting April 2. The bill must still pass the Senate and be signed by President Trump, but Hamilton said the House's action was a direct shot at those benefits. She called it a "hard pill for businesses to swallow, on the heels of the 2015 drought, the 2016 blob, a bad ocean, and the occasional flood." "Climate change, with the frequent, intense environmental changes it brings is hammering the fish and our industry. It is unfathomable that Congress would choose to do less at the exact moment in history when hydropower is needed less than ever. Particularly during the spring when there are over 200 major dams cranking out energy. There's just no excuse," Hamilton says. 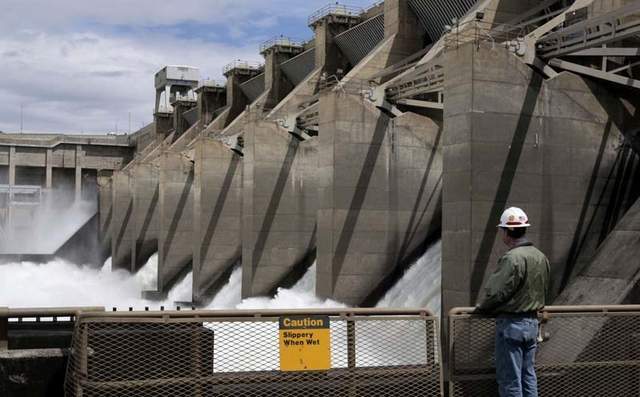 Rep. Cathy McMorris Rodgers, a Spokane Republican who consponsored the legislation, billed it as a way to "protect" the Columbia hydropower system's dams. "When the sun doesn't shine and the wind doesn't blow, our dams provide critical baseload energy to power homes and businesses all across Eastern Washington and the Pacific Northwest," McMorris Rodgers said in a press release. "Not only that, they provide transportation and irrigation benefits for our farmers, flood control for our communities, and recreational opportunities that fuel our economy. This isn't about the merits of protecting salmon, we all agree on that. This is about providing certainty and letting experts and scientists in the region, who know the river best, work collaboratively to meet that goal. I'm proud to usher this legislation through the House." Joining her in voting for the bill were fellow Washington Reps. Dan Newhouse, Jaime Herrera Beutler and Dave Reichert, all Republicans, Oregon's Kurt Schrader (D) and Greg Walden (R), and Idaho's Mike Simpson (R). The Gem State's Raul Labrador (R) did not cast a vote as he was reportedly campaigning for governor. Hamilton says she watched a hearing on the bill and came away "appalled" at what she'd heard bandied about from the other side of the issue. She adds that walking away from even looking at removing Ice Harbor, Lower Monumental, Little Goose and Lower Granite Dams "could mean extinction for many Snake River stocks in the future." "There is an ongoing legal process intended to account for all uses of our critical river system and a court-mandated comprehensive review that everyone can participate in, so I oppose this legislation that would cut off and politicize what should be a robust and transparent process," Murray said in a statement.